You're outraged (OUTRAGED!) that Netflix's price hike has stolen your cheap movie rentals. In fact, you're going to delete your subscription. Forever. Now what? Here's how to replace Netflix in your life, from streaming to shiny plastic discs. Here's what you get with the new Netflix: Unlimited streaming is $8 a month. Unlimited, one-DVD-at-a-time rental is $8 a month. Together, that's now $16 to stream movies and rent discs. Netflix says their streaming library offers 20,000 selections; their DVD library offers over 100,000 shiny pucks. (Whether or not that includes individual TV episodes and DVD discs is unclear. Netflix PR did not reply back to an inquiry.) You also can play videos on a number of home theater devices, including TVs, DVD and Blu-Ray players, iPads, smartphones, and set-top boxes. Plus, you get to use Netflix's awesome queue and recommendation engine, which, to be fair, is underappreciated. If you already order a lot of things from Amazon, the streaming video service appended to Amazon Prime is essentially free gravy. (Amazon Prime costs $80 a year.) Amazon Prime says their library has about 6000 titles, but judging from the ~2000 movies and ~550 TV shows (which are broken down by season), it seems they count individual episodes of TV in that figure. As far as content goes, it's vastly worse than Netflix. Many of the movies offered on Amazon Prime are on Netflix, but Amazon doesn't exactly have the cream of that crop here. And the TV is only attractive if you really love obscure kids cartoons, PBS and old BBC shows. If saving money is really your goal and you already have Amazon Prime, you can do just fine with their streaming video service, even if it isn't spectacular. Hulu's the company that Netflix gotta worry about the most. Hulu's actually owned by the studios, after all (even if they are sorta kinda trying to sell it). $8 a month gets you unlimited streaming access to roughly 2200 TV shows and 1400 films—Criterion!—many of which are playable on TVs, smartphones, iPads and settop boxes. When it comes to TV, Hulu is way, way better than Netflix. They get most of the current network shows—and some key cable ones—as new episodes air. Plus, they've got entire seasons of TV back catalog in their library. There's also a healthy back archive of old TV shows and anime series in their entirety. The movie selection is pretty mediocre and unexciting, save for one important sub-category: The Criterion Collection. If you're a classic film buff, there's enough streaming material here to keep you entertained as you wait for new releases to arrive in the mail. HBOGO is free, but only if you're an HBO subscriber on cable already, and that means you're already paying $40 a month. But if you're a subscriber, you get access to 300 movies currently airing on HBO, and new ones, like Inception plus over 40 HBO series past and present (Curb Your Enthusiasm! The Wire! Deadwood! Treme! ), and another 150 titles from their comedy, documentary and sports vaults. The selection is far more limited than any other service (not to mention costly if you're not already an HBO/cable subscriber), but it's also very high quality. If you mostly watch Anime (and Japanese stuff in general), you'll want Crunchyroll. Alongside Hulu, it's the biggest purveyor of Japanese cartoons, and offers nearly 430 shows in 720p for $7 a month. Plus, it's available on smartphones, Vizio TVs and settop boxes. You're also paying $7 a month for a narrow, but deep, slice of content. What Crunchyroll does for anime, Fandor does for indie films. New films, old films, doesn't matter. Fandor is all about the stuff that major movie studios wouldn't want to touch with a ten foot pole. And while there are some quality films to be found within its 2,500 title catalogue, the service costs $10 a month and the only way to stream content away from a PC is on the Boxee box. Crackle may not have the name recognition of Hulu or Netflix or Amazon, but the Sony-owned company will soon become a force thanks to an embarrassment of exclusive Sony Pictures content and original programming. Moreover, Crackle doesn't cost a cent, and is available on Android (soon), iOS, PS3, Sony TVs and Blu-ray players and settop boxes. Snagfilms is a treasure trove of free documentaries that you can watch online. It has apps available for the iPad, Boxee and Roku, and films such as MacHeads, We Are Wizards and Heavy Metal Parking Lot are included among its 2100 titles. Blockbuster has been in the movie rental business longer than anyone, and arguably have the strongest industry ties, despite running their business into the ground the past 5 years. In terms of selection, their DVD library is the same as Netflix's on paper (~100,000), and they claim to offer a select number of new releases before the 28-day window that Netflix and Redbox are subject to. But their price isn't the same. A one disc plan costs $12 a month. That said, you do have the option of renting games and Blu-ray titles at no extra cost, but if money is the issue, you're not doing yourself any favors by switching plans. Redbox doesn't mail DVDs to your home. Instead, you visit kiosks in over 27,000 locations where you drop and swap discs. Redbox doesn't try and offer every movie. Instead, they have 300 of the newest DVD releases (along with ~50 Blu-ray titles). And Redbox doesn't charge a monthly fee, instead, you pay a single dollar for a one night rental. Redbox is trying to invade the Netflix and Blockbuster space by not directly competing. Instead, they have a highly focused library of films (much like HBOGO) and a pricing plan that could work out to be cheaper than Netflix. I mean, how many people can receive, watch, and send back more than 10 movies a month on a single-disc plan? But the downside is that you have to find a kiosk that's conveniently located. As you might've figured out by now, no matter what you do, you won't be able to get unlimited streaming + DVD rentals for $10 a month anymore. That's the reality. Deal with it. And ultimately, you'll want to skip Blockbuster, because it's too pricey for what you're getting. Amazon Prime is fine if you're a regular Amazon user, but it's hardly worth shelling out $80 just for the video service. And HBOGO is great, but if you don't already have HBO is a whole other financial commitment. That leaves you with three real options here. If you have to stick it to Netflix and tell them to piss off, your best bet might be to go with a combination of Redbox and Hulu Plus. You'll get a great mix of new movies, classic movies and TV shows. Depending on how many Redbox films you rent, though, you'll probably be spending anywhere between $10-$17. If you want more freedom of choice, but still want to show Netflix you're pissed, maybe you just go DVD-only and instead sign up for Hulu Plus, which has better TV offerings and is available on many of the same devices. It will still cost you the same, but you know, you're rebelling. Sort of. Or, if you just want Netflix streaming to get better, cancel your DVD plan and go with Redbox. 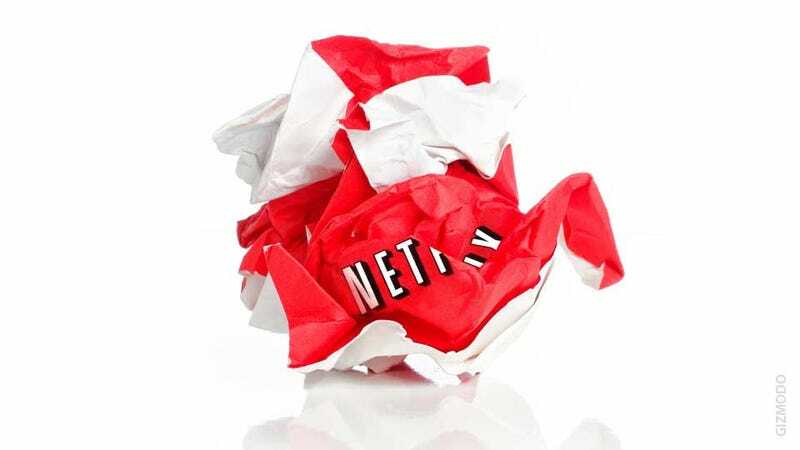 Netflix wants more people streaming because it's cheaper, and it's a valid argument to think that if more people throw their support behind streaming technologies, networks and studios will be forced to deliver content that way. What's your plan?